Unless you’ve been living in a cave for awhile it’s probably safe to assume that there has been moments when you would give just about anything to have a few minutes of peace and quiet to yourself. This could be because of work stress, relationship stress, money stress, or even simply struggling to keep up with your to-do list stress. Finding a quick way to deal with everyday pressure so that you can clear your head and recharge depleted energy levels is not always the easiest thing to do. Sure, it’s easy enough to jump in the car and take yourself down to the beach, or have a weekend pamper vacation, but that’s not always convenient or doable depending on circumstances. Mindful meditation is really just the art of paying attention to the moment with an attitude on non-judgment. Then, when you notice that your mind is wandering, re-focus your attention. One of the most common mindfulness techniques is to watch your breath come in and go out of your body, with particular attention being paid to the feeling of the breath as it comes in through the nose and out through the nose. This helps you to step back from the busy mind and not get so drained by the constant stream of stressful, anxious, annoying, or negative thoughts and feelings that arise as you are faced with the pressures of the day. Just by slowing down and becoming aware of our thoughts and feelings we are able to detach from them. When we do that then the stress response in our body starts to disengage and the relaxation response gets switched on. 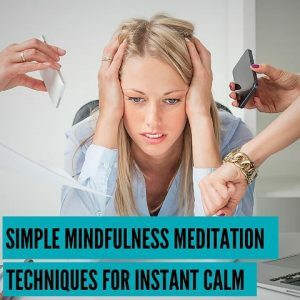 Ideally, you would do this for say 20 minutes at a time for the maximum benefit but even one minute of mindfulness a day is far better than none at all. 1. Stop what you are doing for 1 minute and be perfectly still. Don’t plan to stop, make it spontaneous. Even if you’re just about to pick up your cup of coffee, stop half way and then freeze where you are. Be as still as you can and just be aware of your body. You can breathe, but don’t move a muscle. Then, after 60 seconds, start moving again. This is an awesome technique for bringing your energy back to your body as the mind is constantly moving from one thing to the next and never giving your body a break. Just this simple action of stopping a few times a day for just 60 seconds will leave you feeling deeply centered and more energized. 2. Move you body real slow. A very simple mindfulness exercise is to see how slow you can move your body doing pretty much anything you like. It could be lifting your hand to scratch yourself, standing up from your chair, or even tapping on an app on your mobile device. It doesn’t matter what movement you do slowly, anything at all will do. Regardless of how simple or complex a movement you are doing, go as slow as you can for 30 seconds or more and just pay attention to what your body is doing. Then return to your normal speed and notice the difference in how you felt when you slowed down. 3. Consciously smile. It may sound crazy to smile when you’ve got no reason to or don’t feel like it but don’t let it’s simplicity fool you. This technique can open the door to a happier and healthier frame of mind and body. Start off with a minute or two of smiling and then see how long you can keep it going. Even after a few minutes you’ll notice a positive difference in your mood and demeanor. The brilliance of this exercise is that you get to choose when you do and don’t smile. Just the act of smiling engages muscles in your face tricks the brain into thinking you’re happy which causes it to release happy hormone in the body. While we might think that we smile because we feel happy, we can also feel happy because we smile. Meditation is meant to be simple and the easier it is to do it, the more fun you can have with it and the more benefits you will get from it. Meditation Breathing Exercises For Less Depression Are You Doing Meditation The Wrong Way?